The PS3J100 Interactive Control Center (ICC) is an ergonomically designed multi-functional manual controller for the ProScan® III microscope automation system. The ICC provides local control of accessories, including a stage, focus, filter wheels, shutters and the Lumen PRO range. 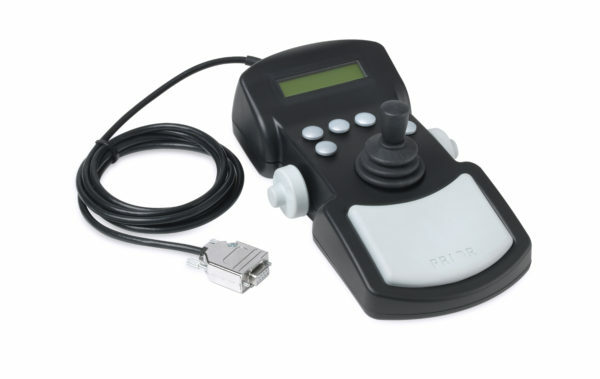 The screen provides positional feedback while the joystick, button and digipots control accessories such as a stage, focus, filter wheels, and shutters. Innovative features in the center allow the user to measure distances, label filter wheel positions with dye names (e.g., DAPI, FITC, etc.) and take fine control of the stage for intricate movements. Giving the user instant feedback as to what fluorophor the system is setup for and where the area’s of interest are located on the stage. It also allows basic diagnostic of encoders, TTL and internal ProScan®III settings, such as axis movement speed. The ICC is also configurable for OEM applications.